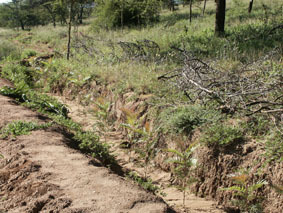 Pictures From Ngare Ndare Dryland Restoration Project. 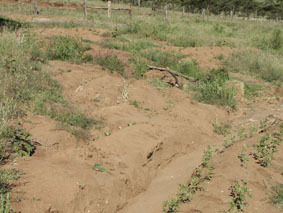 Taken June 2002 about 9 weeks after planting. 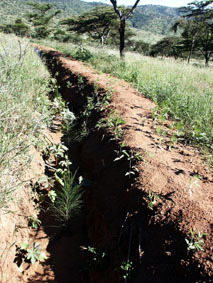 Two adjacent swales with Grevillea robusta trees doing well in the swales and pigeon pea (Cajanus cajan) growing on inside and outside of walls. 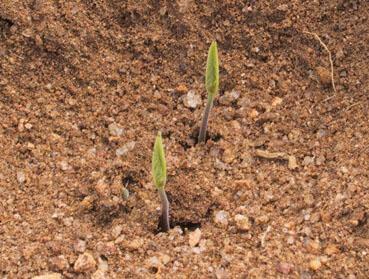 Compare pigeon pea above with 8 weeks earlier (below). 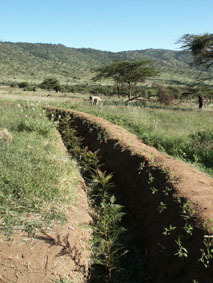 Lush growth as goats are fenced out and swales serve functions of keeping water on site and halting runoff. 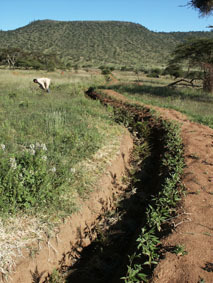 Top swales collecting most of the runoff from above are nearly full of silt in first season. 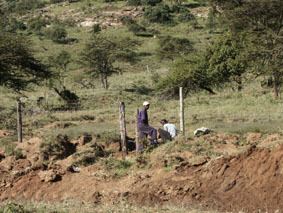 Fencing begins on adjacent site for next project.